The beautiful and sleak design gives you an indication on how many hours has been spent on the drwaing board creating the Portofino. The California T cabriolet has been replaced by the Portofino and Enliven took a trip along Route Napoleon in this new roofless Ferrari. The heart of the Ferrari Portofino is a roaring V8-engine with a massive turbo producing 600 horse powers, off course in coated in the classic red colour. The successor to Ferraris metal cabriolet California is unveiled and has been given the name Portofino which stems from the picturesque and luxurious fishing and summer resort of Liguria, Italy. The predecessor's name, California, originated from the iconic 250 GT California Spyder model built between 1958-1963 with only 104 produced. If you want to buy a 250 GT California Spyder prepare to open up the wallet wide. It will set you back around $18 million on any of the more prestigious car auctions. Ferrari Portofino is a so-called 2 + 2 cabriolet where the rear seats are suitable for dogs, bags or possibly a few underage kids. 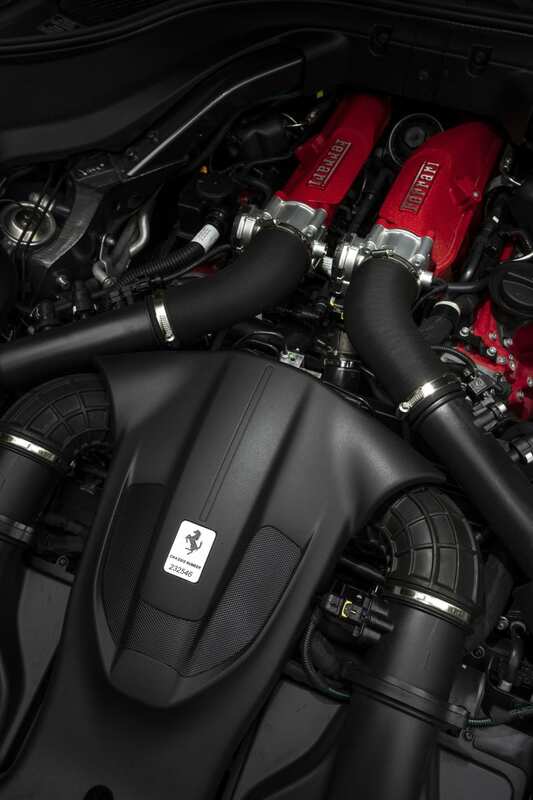 Underneath the hood we find the same turbocharged V8 engine that powers the 488 GTB and GT4 Lusso T. 600 horsepower and 0-60 in 3.5 seconds with maximum velocity reached only when the needle passes 190 miles per hour. In the Portofino, Ferrari has put an incredible R&D effort in getting the right feeling into acceleration, trying to eliminate "turbo-lag" as far as possible. In the development for the sound design of the engine Ferrari was seeking a sound image resembling a big orchestra – where you can enjoy everything from the bass to the soprano. Externally, a lot has changed since the predecessor of California. The car feels smaller and tighter in its frock, but both cars actually have the same axel width. On top of this the Portofino has gone on a diet and shredded 160 pounds, which is great especially when combining this with the extra 40 BHP that the engine offer the driver. During this year's European tour with Gran Turismo Events, I was given the opportunity to test drive a Portofino owned by Olav Medhus from the Norwegian Ferrari dealer Autoxo. The stretch of road for the drive was the last part of the event between Monaco and Cannes, over the classic Route Napoleon. The road, is actually named Route Nationale 85, after Napoleon Bonaparte when he arrived in Golfe-Juan on March 1, 1815. Leaving his exile on the island of Elba, Napoleon was returning to the throne and quickly wanted to reach Lyon without having to face troops friendly to the old regime in the Rhone valley. The rear of the Portfino has gone through a major redesign since its predecessor the California and feels perfected. The four exaust pipes was been properly reworked and offer a fantastic soundtrack. The leather work in the interiors of Ferraris always is pristine. The combination of black and red leather trim gives a very exclusive feel to the interior. The interior of Portofino is like other Ferrari models very driver oriented. Behind the steering wheel there are no levers with the exception of the padles. All controls normally located there is controlled from the steering wheel. The road runs north of the French Riviera and include some incredible sections with long winding and truly amazing mountain roads, a challenging drive also for the most experienced drivers. In other words, perfect for the Portofino and taking each curve was a delight. The R&D Ferrari put into the engine and the turbocharger has paid off, with power available in abundance. On the steering wheel, the lever called "Manettino" in Ferrari language, gives you three different and distinct driving modes, "Comfort", "Sport" and "ESC OFF". Each drastically changes the car's character, with the latter is intended for those who really know what they are doing. With the anti-skid system completely turned off, you get no help from the car if losing control. On these curvy roads when you want the car to be on its toes Sport is the best driving mode for most of us. A quick gas response, solid gearbox and harder suspension and chassi effortlessy helps you understand what's happening underneath the tires. Nowadays, Portofino has an electronic power steering as well as an electronic diff rear brake. This obviously affects the behavior positively on the road and gives you an incredibly good handling even in high speed and on the winding road, this despite having 600 horse powers on the rear tires. The interior has been going through a major update, even though you still can see clear resemblance to its predecessor. Something new is that you, as a passenger, have a small screen showing engine data such as RPM, speed, G-force and more. The screen came first in the FF model and is a fun detail. The leatherwork of Ferraris cars is always something extraordinary and Portofino is of course no exception. On top of the dashboard is a leather lining reminding you of the most exclusive luxury bags. The fan outlets are made of thin metal and feels extremely lavish. Instead of regular carpeting, your feet are positioned on perforated aluminum plates. Very stylish and similar to those in racing cars. As with many other Ferrari models, there is no ordinary gearbox but a center console with three-buttons; "R", for reverse, "Auto" to return to automatic mode if you have chosen to start manually switching with the paddles on the steering wheel, as well as "Launch" for launch control and that gives you an optimal sprint from standstill. Thanks to its metal retractable roof, the Portofino is a nice drive also with the roof up. However, I do not explore this further this hot and sunny day. On the passenger side there is a screen where information like RPM, speed, g-forces and much else are presented to the passenger. All Ferrari models has emblem with the modell name on the dashboard. 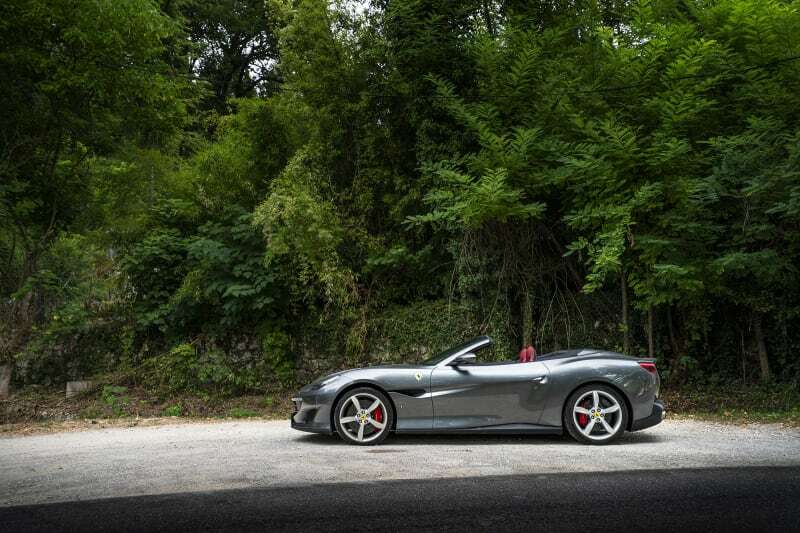 Ferrari Portofino is a car for your regular hedonist with a big wallet. This is definitely the Ferrari model you should pick if you love fantastic driving, but at the same time you want a car that works even when weather is at its worse. You can say that Ferrari Portofino is the perfect everyday car. If this makes Enzo Ferrari turn in his grave or possibly applaud, I will leave unsaid. Base price: From 2 600 000 SEK. Engine: 3.9-liter turbocharged V8, 600 bhp. Torque 761 Nm. Power transmission: Front engine, 7-speed automatic transmission, dual coupling, rear-wheel drive. Acceleration: 0-100 in 3.5 sec. Top speed: 320 km / h.
Petrol consumption mixed driving according to the manufacturer: 1.07 l / mil. Guarantees: New car 3 years, engine 3 years. In the center console is a ramp for the gearbox selectors and next to that the controls for the automatic metal roof. Man känner tydligt igen fronten och grillen på Portofinon med övriga Ferrari modeller. I started my true photo career with skateboarding. My friend and I liked to take pictures of each other doing tricks. Before I knew it, I was working with Swedish skateboard magazines. After a couple of years in art and photography schools, I established my company, James Holm Fotograf.